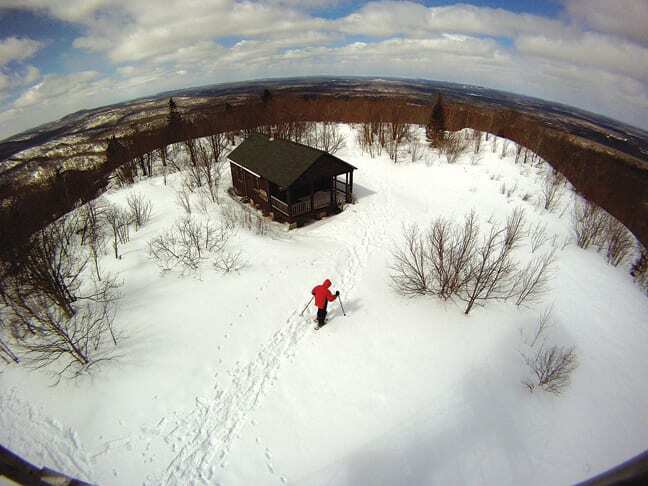 On a brisk winter day, my dad and I set out for a snowshoe excursion up Mount Arab, a small peak with a restored fire tower west of Tupper Lake and a panoramic view of the northern Adirondacks. Because the climb to the 2,545-foot summit is only a mile, with an elevation gain of 760 feet, this is a good trip for children or novice snowshoers. 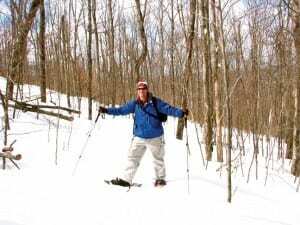 We saw no other people on this weekend day in March, but judging from the packed trail and postholes, Mount Arab does get climbed in winter. As we ascended, we began to realize how the silence of the wilderness had enveloped us, interrupted now and then by a chirping bird or scampering squirrel. Farther up the mountain, the stillness was disturbed more profoundly by a woodpecker hard at work during his lunch hour. 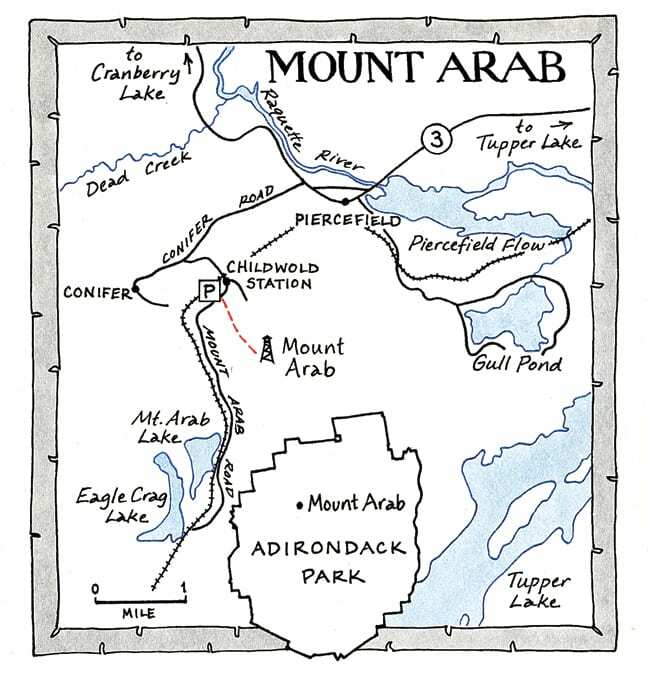 The Friends of Mount Arab is a non-profit group that maintains the summit facilities. When we reached the ridge near the summit, I paused to take photographs of the view ahead and the white birches that dominate this part of the forest. When I caught up to my father again, I noticed little clouds of mist billowing around him. He had taken off his tuque, and his head was steaming! Even on cold wintery days (it was eighteen degrees), it’s easy to work up a sweat. Be sure to dress in layers (non-cotton) that you can shed as you heat up. Upon reaching the summit, we were hit by a gust of wind from the south. 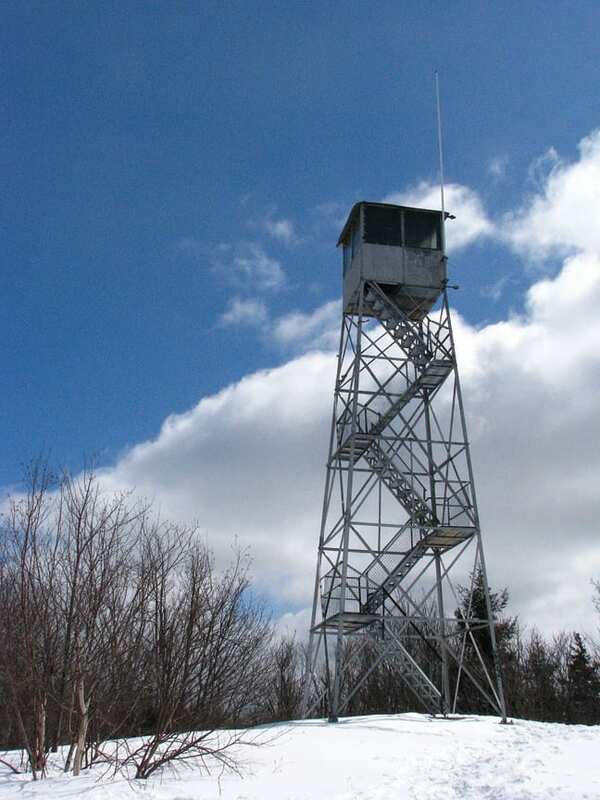 Mount Arab offers nice views from its summit, but you’ll find even better vistas from the thirty-five-foot fire tower. Built in 1918, replacing a log tower, the steel structure and the ranger’s cabin at its foot were restored in recent years by the Friends of Mount Arab, which formed on Earth Day in 1997. The group sponsors a summit steward in summer who tells visitors about the mountain’s history and its flora and fauna. After taking off my snowshoes, I began climbing the tower steps and noticed that my father was not following. “I don’t do as well with heights now that I’m getting older,” he replied. But I managed to persuade him to come up and enjoy the 360-degree view from the tower cab. On a clear day, the views go on for miles. To the east, you can see Tupper Lake and, farther off, a number of the High Peaks (Whiteface is thirty-miles away). 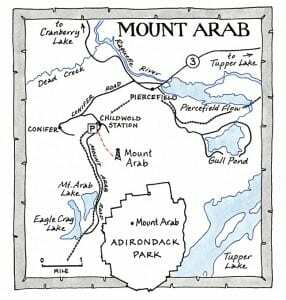 Other landmarks are Mount Arab Lake, Eagle Crag Lake, and the Raquette River. Inside the closed cab, we could enjoy the scenery at our leisure without having to endure the cold wind. Evan Williams is a happy hiker on his first trip up Mount Arab. Observing the Adirondacks from the tower, we understood why the Friends of Mount Arab have gone to so much trouble to save this piece of history. It’s a magnificent place in any season. 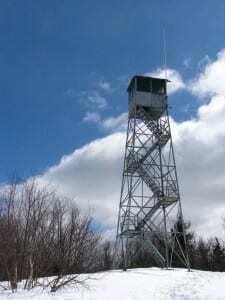 Unfortunately, this past October vandals damaged the cabin and fire tower. Among other things, they broke windows, smashed furniture, spray-painted walls, and tipped over an outhouse. Two teenage boys were accused in Family Court of doing the damage.